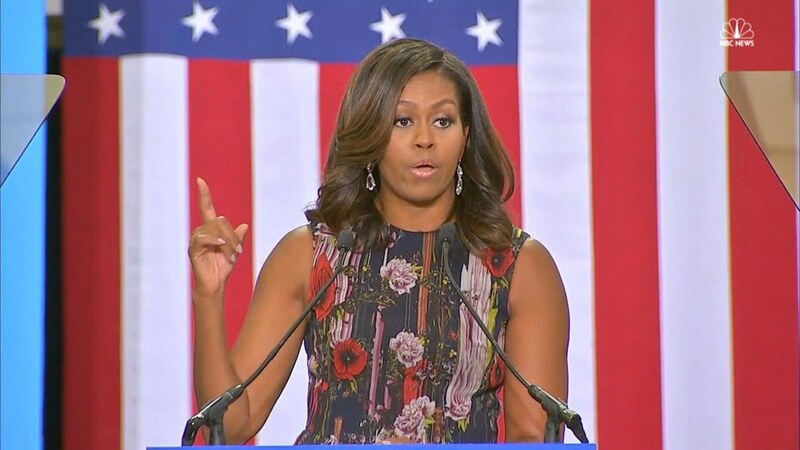 First lady Michelle Obama on Friday said her nearly eight years in the White House have made it “excruciatingly clear” that Hillary Clinton is the only qualified candidate in the 2016 presidential race and responded to the continued false rumors about her husband’s birthplace. “A candidate is not going to suddenly change when they get into office. It’s the opposite, in fact, because the minute that individual takes that oath, they are under the hottest, harshest light there is,” the first lady said in Virginia during her first campaign rally for Clinton. “With every word they utter, they can start wars, crash markets, change the course of this planet...For me, it is excruciatingly clear that there is only one person in this election that we can trust with those responsibilities,” she added. The first lady did not mention Donald Trump by name but took him to task pushing “birther” rumors that falsely assert President Barack Obama was born outside the United States. “Of course there were those who questioned and continued to question for the past eight years up through this very day whether my husband was even born in this country. Well, during his time in office I think Barack has answered those questions with the example he set by going high when they go low,” she said. At a campaign event earlier in the day, Trump reversed his previous remarks and conceded that Obama was born in the United States. The first lady is one of the most popular political figures in the country and could be a valuable surrogate for Democrats as polls continue to tighten. Her speech at George Mason University in Fairfax, Virginia, was aimed at fighting back apathy associated with a negative campaign that could prevent voters from showing up to the polls. “I am inspired because for eight years, I have had the privilege to see what it takes to actually do this job. And here's what I absolutely know for sure...Right now we have an opportunity to elect one of the most qualified people that has endeavoured to be president,” she said.